This bout was OZRG's first bout ever. It was an honor to pop their bout cherries! They were great. From the minute they got to Rollarama, they were all about helping us set up and get ready. This bout was kinda cool for me because I went to college with one of the Oz skaters - Insane Assilem! (Top row, second girl from left). She lived right across the hall from me in good ol' Steinmetz Hall at SUNY Albany. 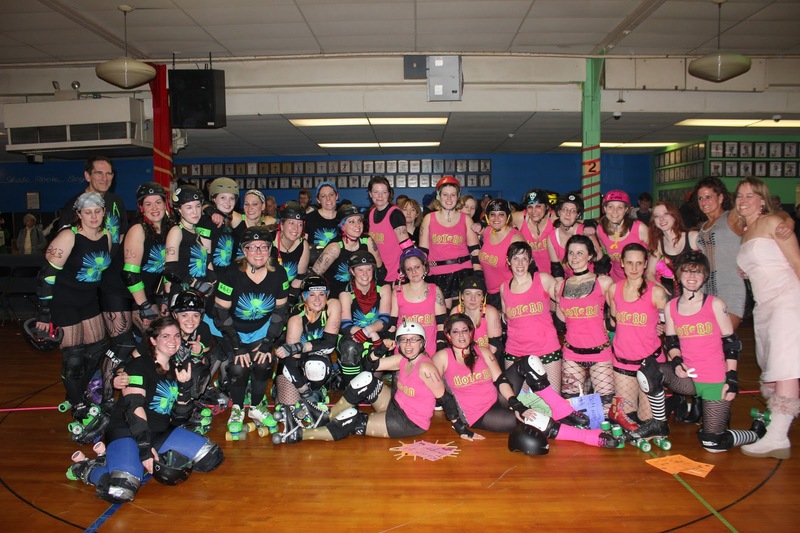 Whoever thought Steinmetz would produce two rocking derby girls? Then again, there's a lot it produced that none of us ever could've called. HoT & OZRG post game smiles! Nice job all. Photo by Lindi Himes (via facebook). This won't be the last we see of OZRG. They've been known to swoop in on Assault City Mixed Scrimmages - I'm sure we'll see 'em there sometime soon!